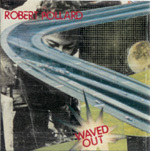 Collages by Robert Pollard. Back Cover: "Do You Know How To Change Water? ", Front Cover: "The Dawn Of Cars (And Their Hitches)". Photo of 2 Bobs by Charley Meyer. Design by Bob Ohe, Mark Ohe & Frank Longo. Collage Name - Back Cover "Do You Know How To Change Water?" Collage Name - Front Cover "The Dawn Of Cars (And Their Hitches)"